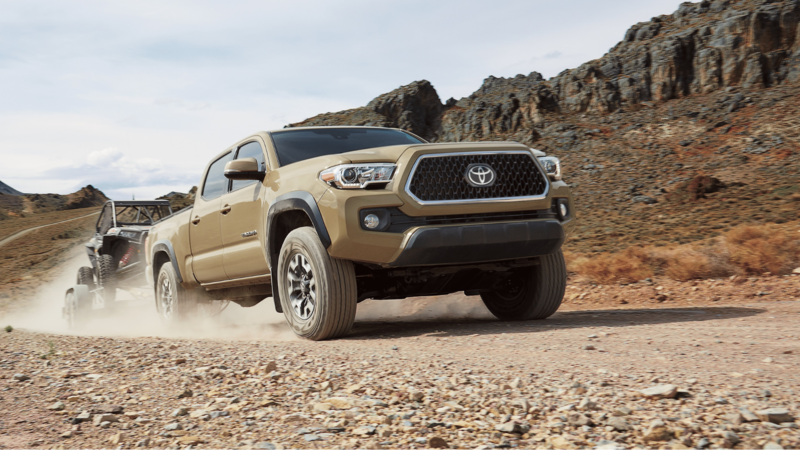 Building on its reputation as an off-road icon, the 2019 Toyota Tacoma impresses with its rugged 4X4 capabilities, bold style, and cutting-edge technology features. Eye-catching design elements of the Tacoma include an available hood scoop, aggressive front grille, muscular fenders, and an embossed tailgate logo. Whether you opt for the standard 2.7-Liter 4-Cylinder or the available 278-horsepower 3.5-Liter V6 — the Tacoma packs plenty of performance to help you tackle the toughest tasks. Conquer rough terrain with available features such as a Multi-terrain Select System, Crawl Control, and an electronically controlled locking rear differential. Included as standard on every Tacoma model, Toyota Safety Sense™ P (TSS-P) is a suite of active driver-assistive safety features designed to keep you and your passengers out of harm’s way. You’ll also enjoy an ergonomic interior featuring intuitive controls and premium soft-touch material found throughout. There are some slight revisions and updates to the Toyota Tacoma lineup for 2019. Toyota has expanded the availability of the V6 on entry-level SR Double Cab trims. In terms of exterior colors, Inferno has been discontinued while Cavalry Blue and Voodoo Blue are now available. A new SX Package is now offered on SR models as well. This package adds 16-inch black alloy wheels along with black overfenders, mirror caps, and door handles. It’s available on six different colors on both 4X2 and 4X4 models. Lastly, the Tacoma TRD Pro gets some updates for the new model year. Changes include an additional 1-inch of suspension lift, LED fog lights, a revised “TOYOTA” front grille, and a new Desert Air Intake snorkel. New standard equipment on TRD Pro models also includes a moonroof and the Entune™ Premium JBL audio system. Tacoma shoppers will have their choice of a standard fuel-efficient 2.7-Liter 4-Cylinder engine or a powerful 3.5-Liter V6. All V6 Tacoma models come standard with a Tow Package, giving this truck the ability to tow up to 6,800 pounds or carry a payload of up to 1,440 pounds. Included in this package is Trailer-Sway Control (TSC) which is able to apply brake pressure to specific wheels while managing engine torque in order to keep things under control. High-strength, hot-stamped steel is used in the construction of every 2019 Tacoma to ensure maximum performance and safety. 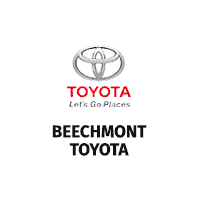 The bed of the Toyota Tacoma is made up of an ultra-durable, fiber-reinforced Sheet-Molded Composite (SCM) which is engineered for durability and toughness. 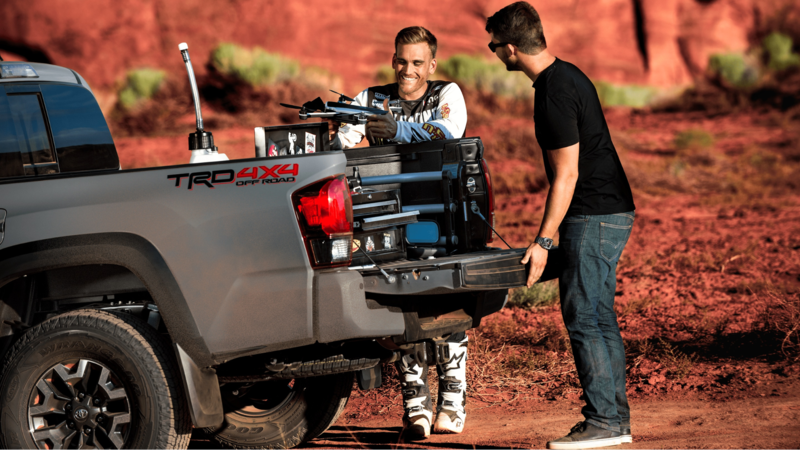 Standard on Tacoma TRD Off-Road models, an electronically-controlled locking rear differential distributes power evenly to both rear wheels in order to achieve greater grip in low-traction situations. An optional Multi-Terrain Select system features five individual modes to help mitigate wheelspin across rugged road surfaces. Available Hill Start Assist Control (HAC) and Crawl Control (CRAWL) provide assistance to reach even the most remote destinations. Delivering consistent performance when things get bumpy, optional Bilstein® shocks are the perfect solution. For those looking for the ultimate in midsize pickup performance, Tacoma TRD Pro models feature exceptional off-road abilities. 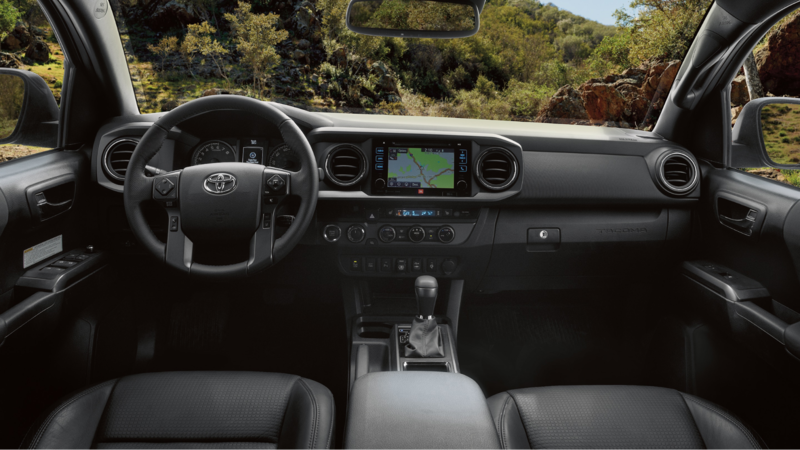 Whether it’s after a long day at the job site or a relaxing weekend camping trip, the interior of the 2019 Toyota Tacoma gives you a welcoming environment to get comfortable. Perfectly suited for work or play, the layout of the cabin is centered around the driver with a look that’s both sophisticated and ergonomic. Fine-tune your temperature preferences with a front dual-zone climate control system. Helping you monitor critical information such as fuel economy, Pitch and Roll settings, and individual tire pressures is an available 4.2-inch Multi-Information Display (MID). A specialized cab-to-bed seal keeps the interior of the Tacoma pleasantly quiet. Other premium features offered on the Tacoma include leather-trimmed seating surfaces along with a power moonroof. Helping to keep all of your devices powered-up is an available 120V/400W outlet integrated into the bed of the Toyota Tacoma. All of your gear can stay safely secured thanks to an innovative standard deck rail system which features four adjustable tie-down cleats inside the bed. A dedicated storage compartment adds additional storage for items such as your tools. 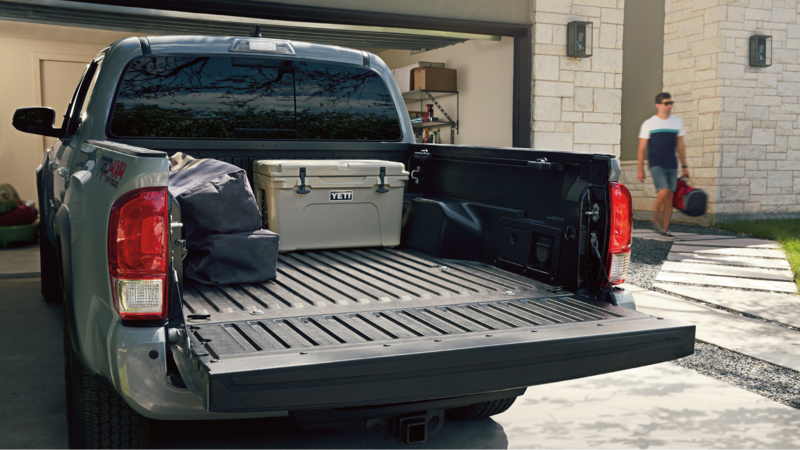 The Tacoma also features an easy-lower tailgate which opens effortlessly, can be locked for added security, and is also easily removable if desired. Take your adventures viral with a standard GoPro® mount located directly on the windshield, helping to create lasting memories which you can share with the world.